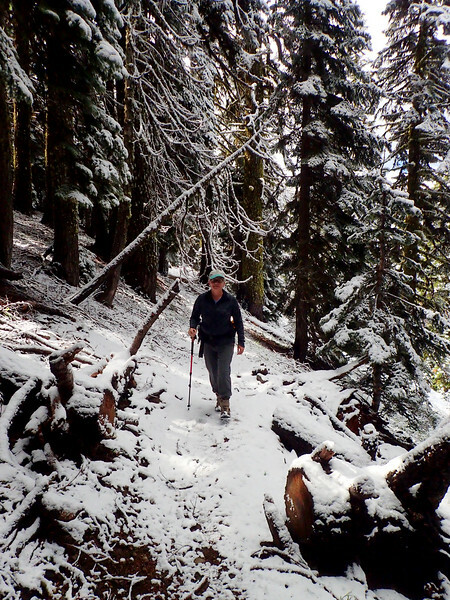 When our friends Wayne and Diane came north to join us on our recent raft trip of the Rogue River (Rogue Rafting), we looked around for a short dayhike to give them a small taste of the hiking opportunities here in Southern Oregon. 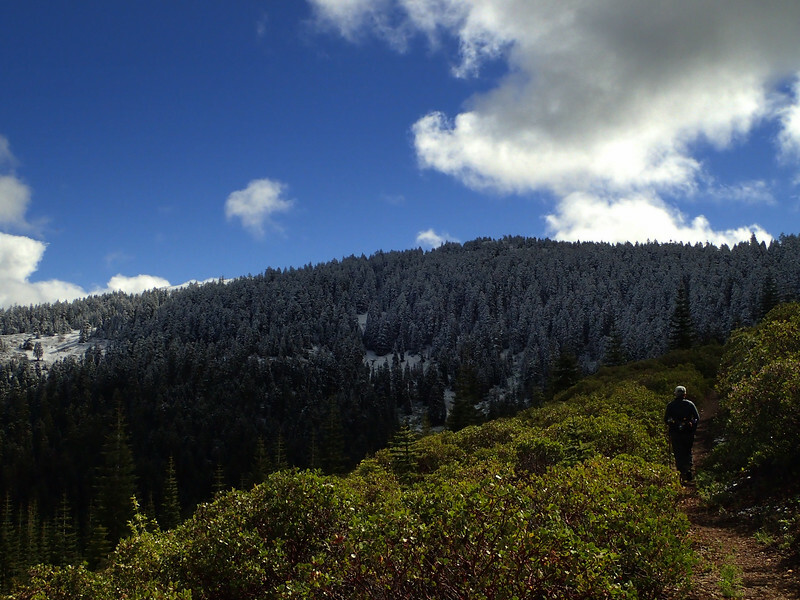 While doing so, we came across a delightful little guide to local hikes (Favorite Hikes of the Applegate, Diana Coogle and Janeen Sathre, Laughing Dog Press, 2013) which described what the author’s called the “Silver Fork Trail” along the Siskiyou Crest west of Mount Ashland. 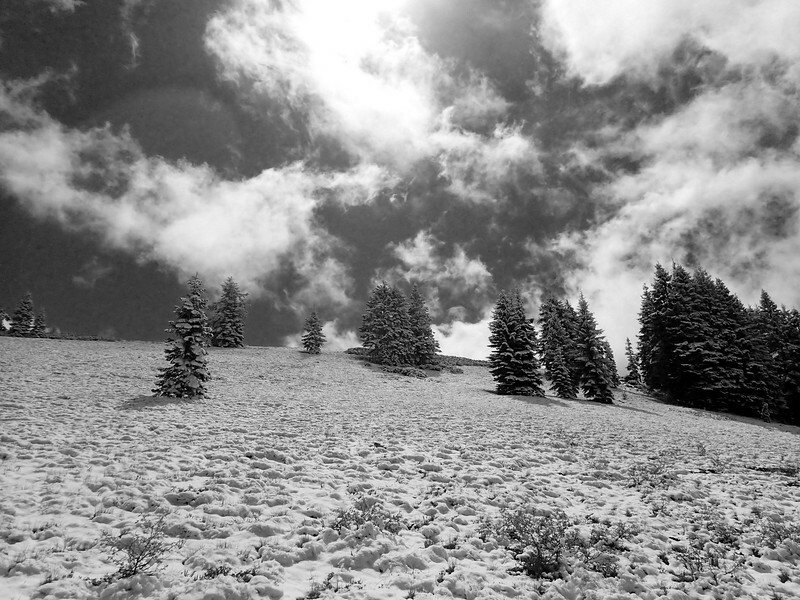 If you miss the wildlflowers at lower elevations earlier in the season, then the high, flower-rich meadows scattered along the crest offer a chance at floral redemption. 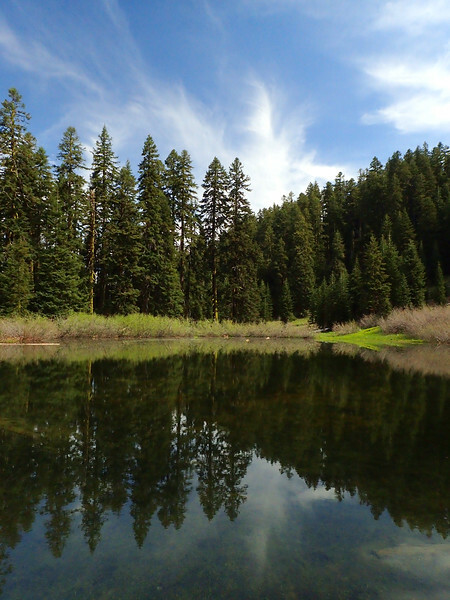 Using the Silver Fork Trail as inspiration, we took Wayne and Diane on a short out-and-back dayhike along the Pacific Crest Trail (PCT) to Kettle Lake, where we were greeted by a mighty frog chorus. This short hike was just a teaser and we planned to return and attempt the loop described by Coogle and Sathre. We had to bide our time as some truculent El Niño-inspired weather passed through the area but then we were off. One plus of this hike is that it’s acessible on paved and good gravel roads. You take Highway 238 from Medford through Jacksonville and on to Ruch, where you turn south (left) on to Upper Applegate Road. After 9.5 miles, you turn east (left) on Forest Road 20 (Beaver Creek Road) – which becomes gravel after a few miles – and follow that to a 4-way junction at Silver Fork Gap. 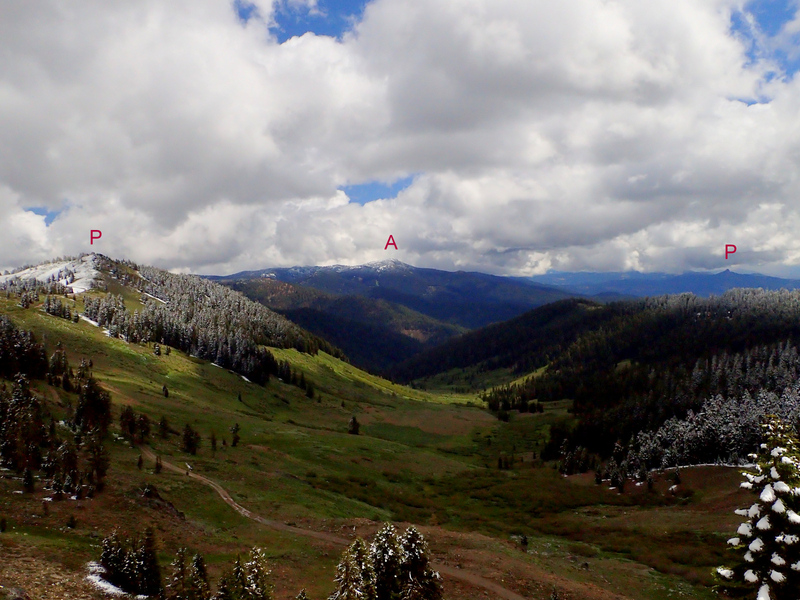 FR 20 goes east (left) here, but you go straight (south) on FR 2025 to where the road crosses the PCT at Donomore Meadows. There’s parking here for 6-8 cars. Post signs mark the PCT on both sides of the road. 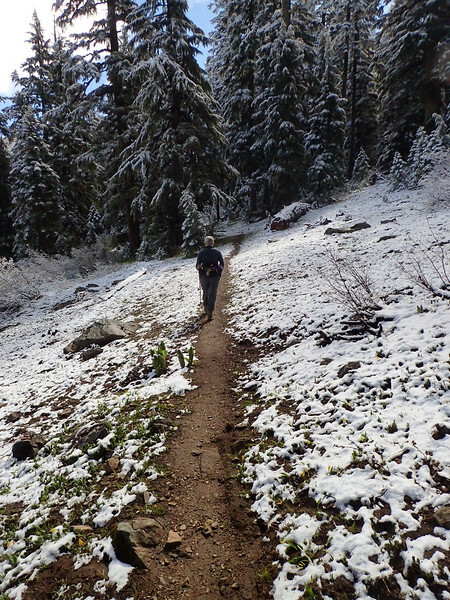 When we’d been up here two weeks ago with our friends, the trail still had a few patches of snow on it. 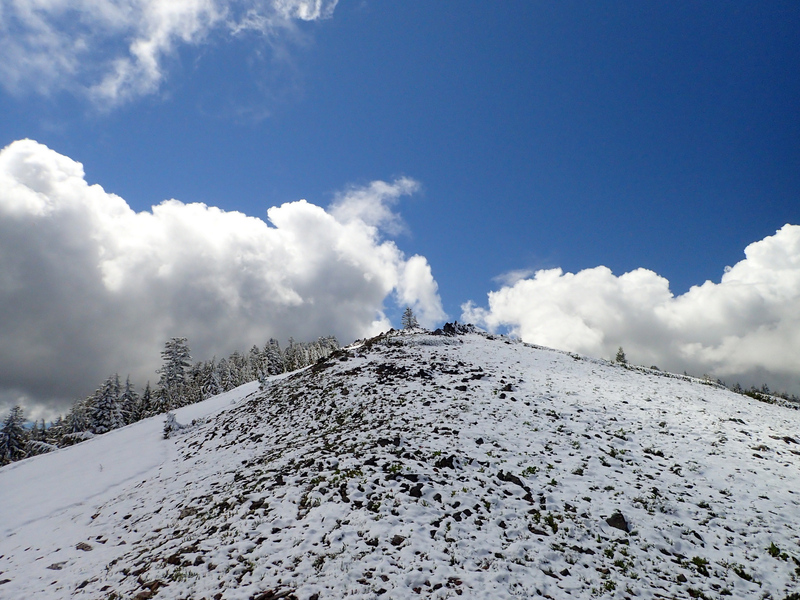 The intervening weather had featured several 90º-100ºF days – so the patches of old snow were gone – only to replaced with 2-4 inches of new snow! 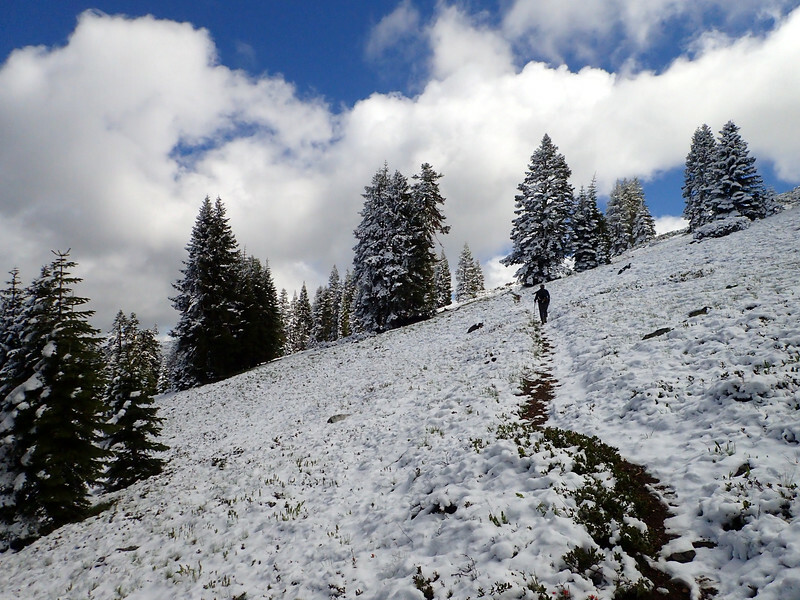 So as we started east on the PCT, we could see that the trees ahead and above us were wearing a new coat of powdered snow. 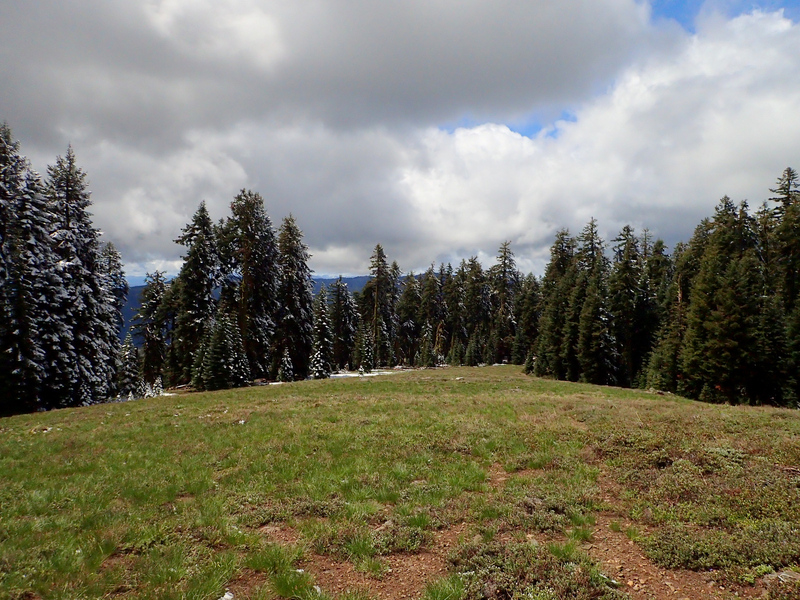 The PCT climbs from about 6,200 feet at the trailhead up to around 7,000 feet on the northwest ridge of Observation Peak. 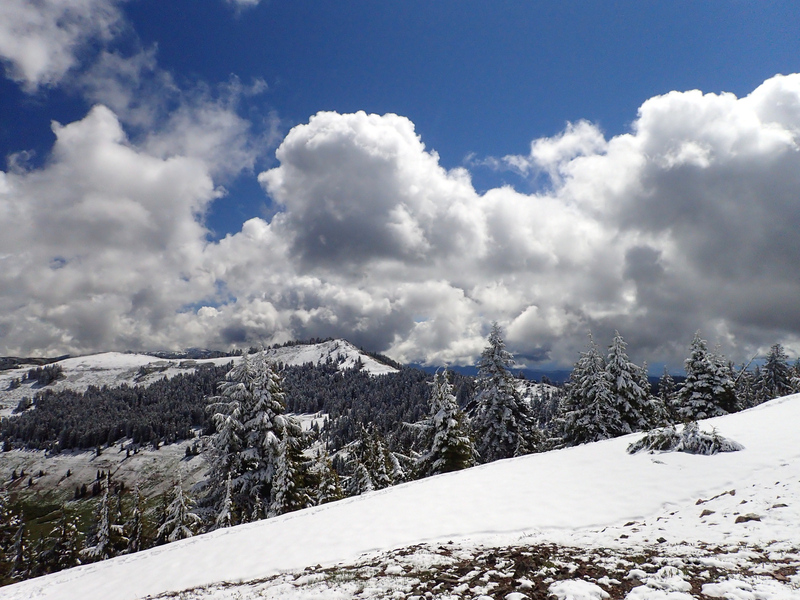 As we climbed, the snow got more and more evident. 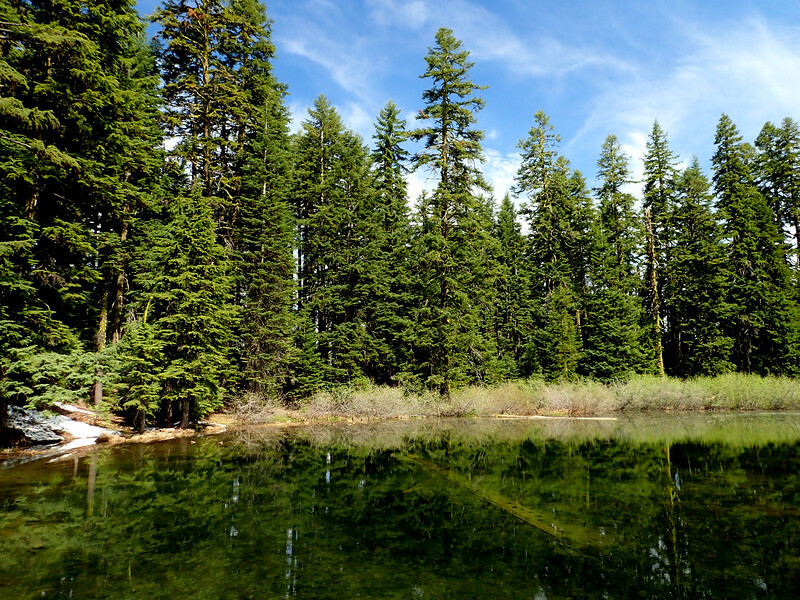 Two weeks ago, we’d dropped off the PCT to visit Kettle Lake, a shallow (6-8 foot deep) but swimmable large pond that was then redolent with chorusing frogs. They were still chorusing, despite the 2-3 inches of new snow that now ringed the lake. 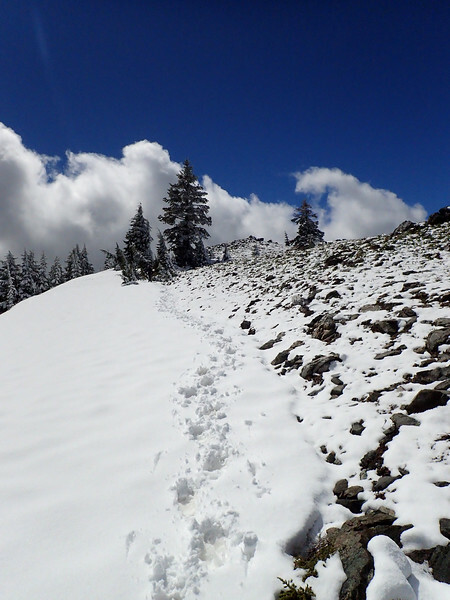 This time, we continued on the PCT past the lake and on up into the now snow-covered meadows on the west side of Observation Peak. 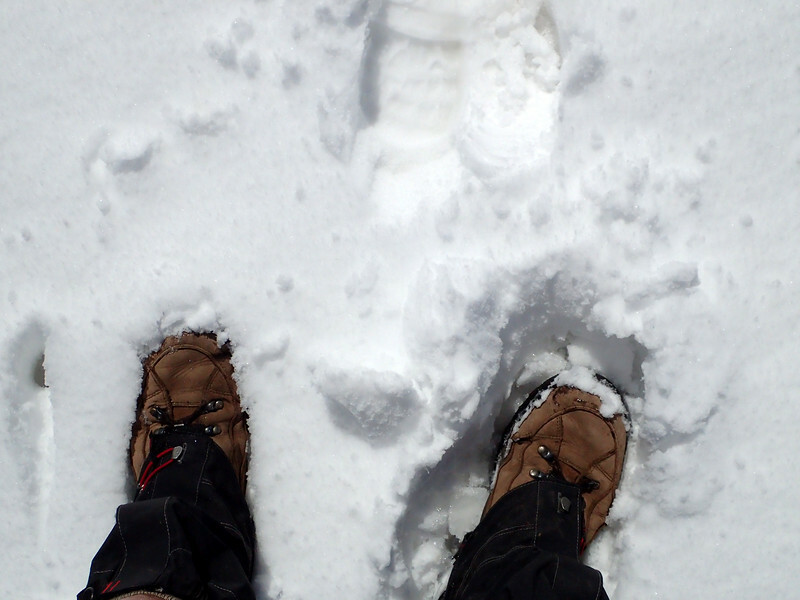 and a few inches of new snow! 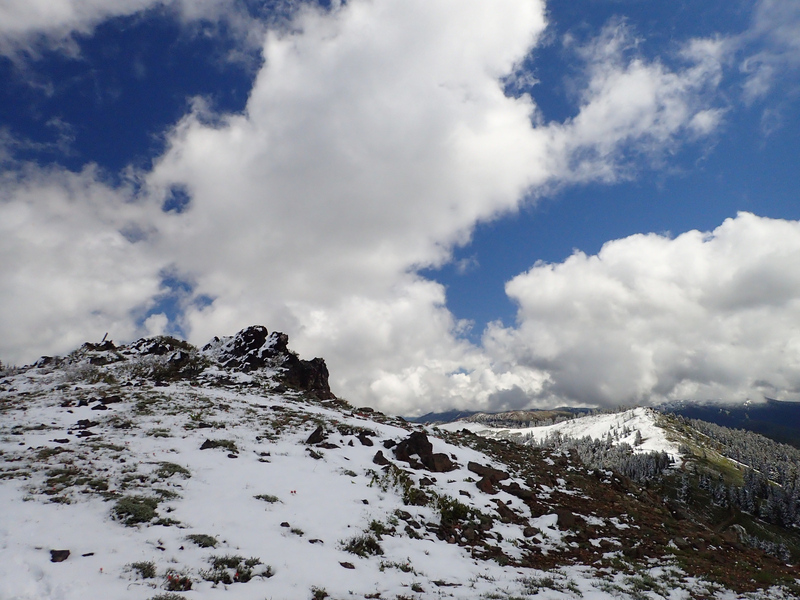 From this open area on the ridge, we had expansive views of the ridges and new snow to the west, including the lookout atop Dutchman Peak. Dutchman Peak Lookout, which is still staffed in the summer months, is the last of the original cupola lookouts still in use. 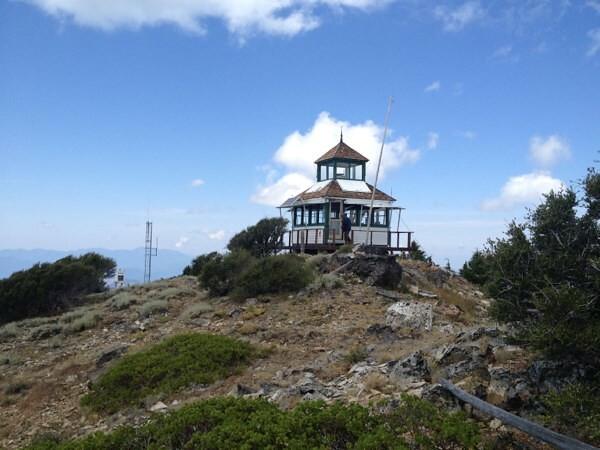 Built in 1927, it is one of the oldest lookouts remaining in service in the United States. A garage was added in 1937, but converted to living quarters for the Aircraft Warning Service in 1942. It is a favorite stop for drivers and bikers on the Mt. 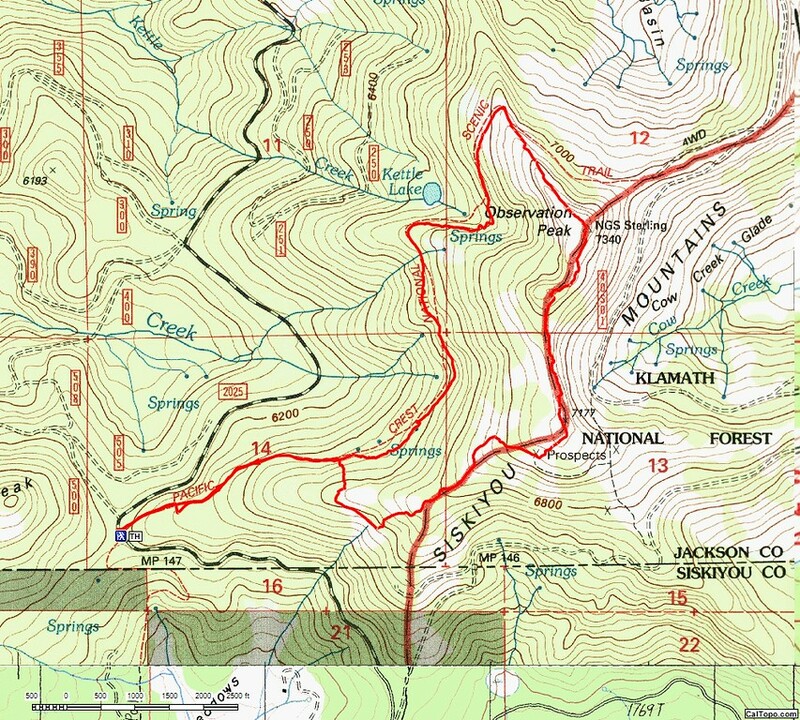 Ashland Loop Road and for hikers on the nearby Pacific Crest National Scenic Trail. 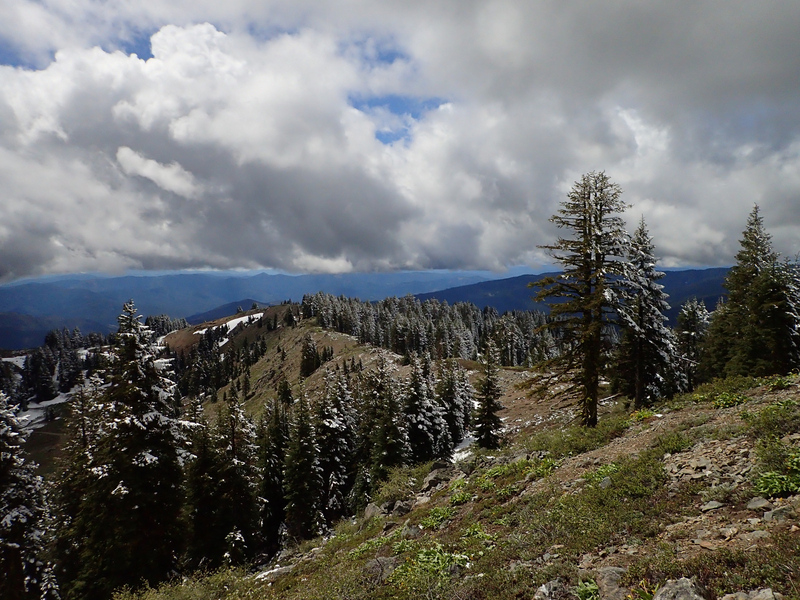 We also had a great view of the now snow-encrusted Siskiyou Crest to the east. 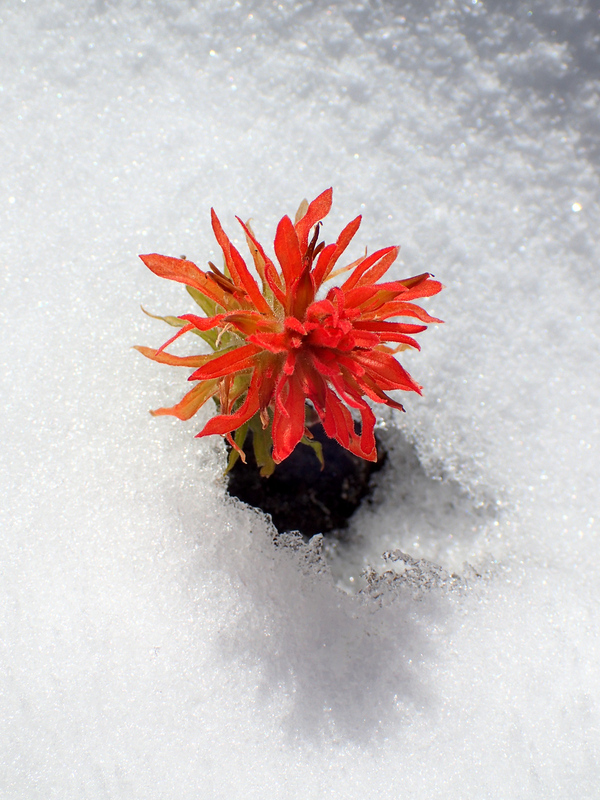 noticing along the way how the flowers, like this Indian Paintbrush, kept going despite the new snow! 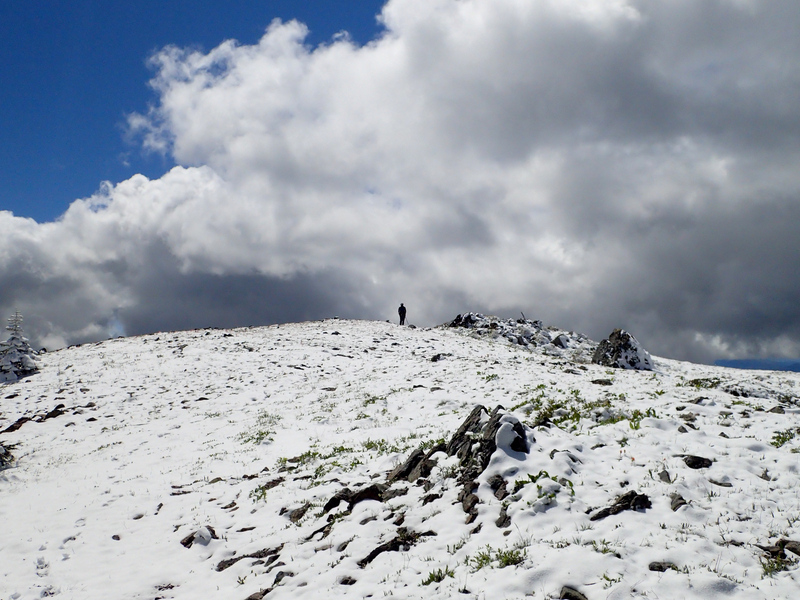 The day had started out with blue skies and the promise of clearing but by the time we reached the summit, clouds were boiling-up from the south and west. Sigh. 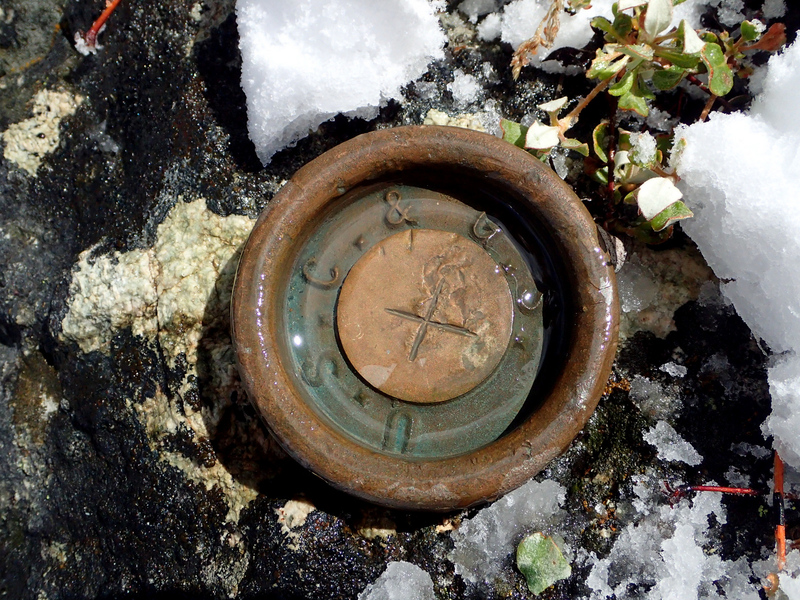 There’s a U.S. Coast and Geodetic Survey marker on the summit, one that was first placed in 1904. The Oregon-California Boundary survey party came through here in the late 1860s and may also have placed a (now long gone) marker on the summit. There’s also supposed to be a geocache up here somewhere. 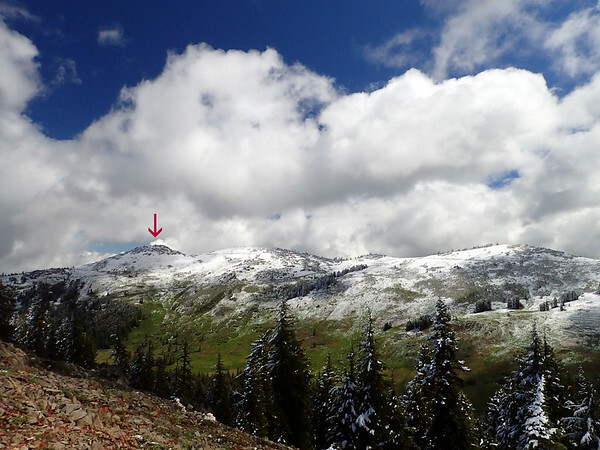 The summit register had a number of entries, including one by a person who reportedly skied to here from the Southern Sierras back in April! From the summit, we could look south along the ridgeline back toward the trailhead. 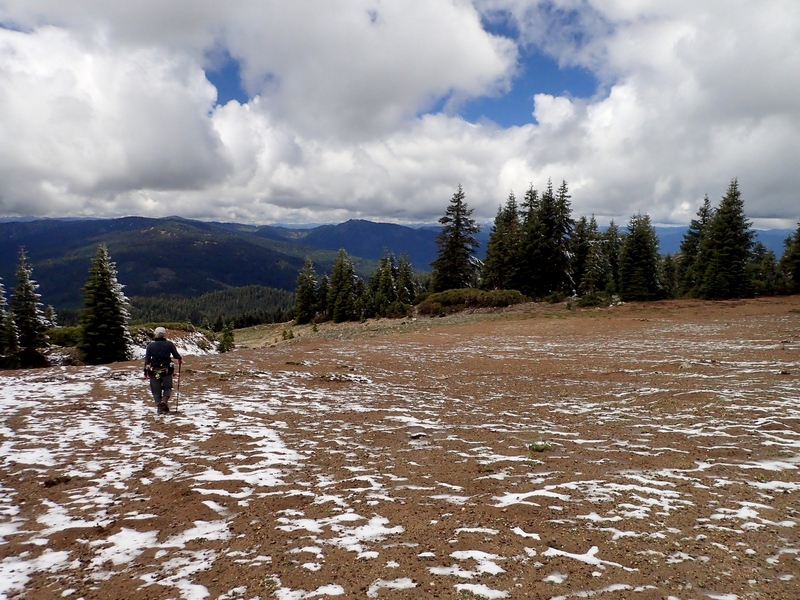 The ridge looked pretty open (i.e., manzanita-free), so we decided to use it as a cross-country return route. The ridge proved to be very open and easy to traverse. We were drawn into just one manzanita thicket – easily gotten out of – where we surprised (and were surprised) by a female elk and her calf – they just erupted out of the brush in front of us and bounded off downslope. After waiting to let our heart rates fall, we continued on. 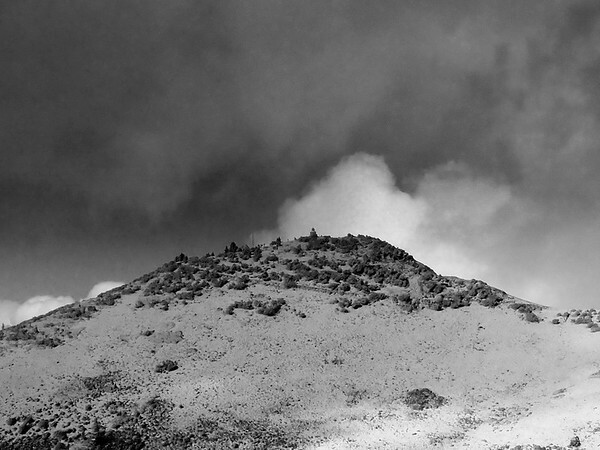 The ridgeline gave us, despite the clouds, a good view of Mt. Ashland and other highpoints to the east. 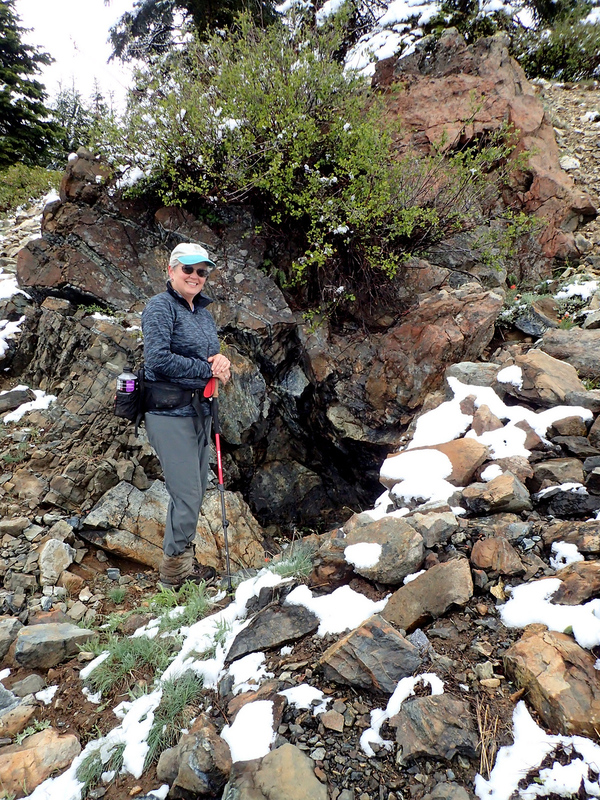 and an old prospect – a few shallow holes blasted into rock outcroppings – part of the long history of mining in Southern Oregon (most of it poverty-inducing, rather than millionaire-making). before finally dropping down to the PCT at the springs about 0.5 miles from the trailhead. We thought it might be possible to continue west along the ridge crest all the way back to the trailhead but walls of manzanita brush dissuaded us from trying this route. All in all, a very fun, big view, short hike (5.2 miles round trip, 1,100′ elevation gain) with a visit to a lake and opportunities for late season floral displays.